MOTO G series phones are popular among Android users as the fast speed, excellent camera and super long battery life. The MOTO G4 is going to be available soon. If you want to change a new phone, you can consider it seriously. Many MOTO G users are using SD card to save their photos. It’s a nice idea. But it is also really easy to lose or accidentally deleted photos from your MOTO G’s SD card. In this article, I will show you how to recover deleted Photos from MOTO G. I will use Android Data Recovery in this article. Android Data Recovery can scan your MOTO G phone easily and find the deleted photos from your phone and SD card. You can recover deleted photos from MOTO G easily. You can also recover deleted text messages from Motorola phones based on Android OS and videos, contacts, call logs, whatsapp messages and other data. 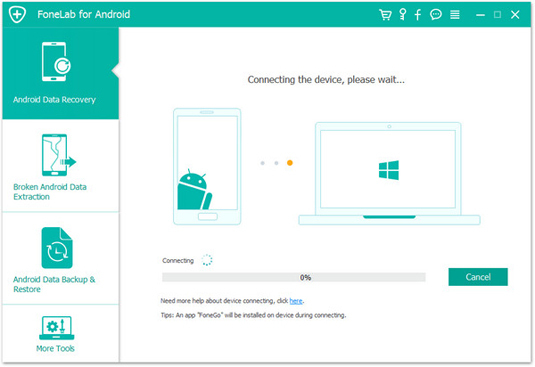 Run this recovery software on your computer and plug your phone to your computer easily. This software can easily detect your phone and load your MOTO G to its interface easily. The software will scan your MOTO G and find the deleted photos for you easily. Before scanning, you need to first enable USB debugging mode on your phone and allow the Superuser authorization for this recovery software. You can follow the instruction on the interface to finish the two things above. Click “Next” button and the software will scan your phone to find the deleted photos and other deleted data for you. This recovery software will list all the data on the interface after scanning. You can find a data list on the left side of the interface. You can also preview the deleted photos before recovering them. Find the “Photos” section on the data list and click to enter it. All the photos on your phone are listed here including the deleted photos. The deleted photos’ names are in red and you can find them easily. 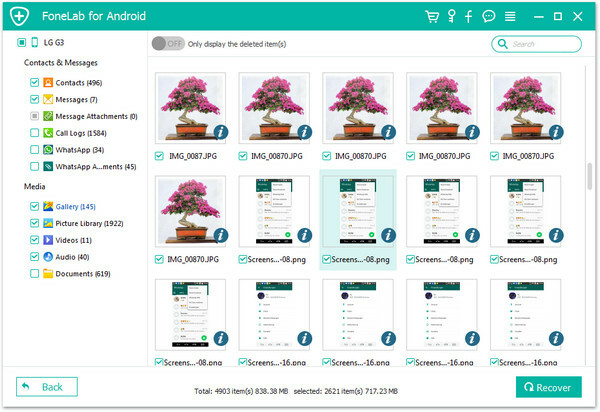 Select all the photos you want to recover and preview them without the recovery software. Click “Recover” button, the software will recover all the selected photos from MOTO G to your computer as soon as possible. This Android Data Recovery can easily find and recover deleted photos from MOTO G and SD card for you. It can also recover deleted videos, contacts, messages, call logs, whatsapp messages and other document files from MOTO G phones.